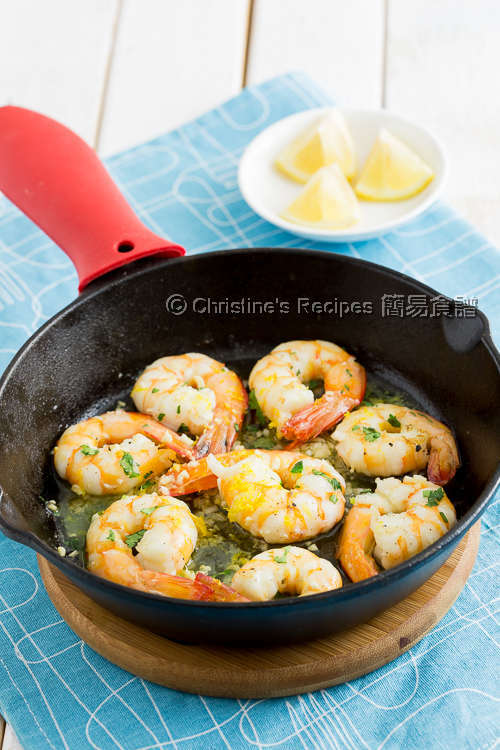 This Lemon Garlic Prawns dish is absolutely simple and easy to make. What you need are only garlic and lemon. It won't take long to enjoy this refreshing and delicious dish. Here comes another delicious prawn / shrimp dish. These large king prawns were really a bargain got from a nearby supermarket. The prawn meat was so fresh, springy and delicious. Prawns can be cooked through in a flash. So I could be a bit slack when making this dish. Let it pan-fry until almost cooked through. The cast-iron skillet can help retain the residue heat. 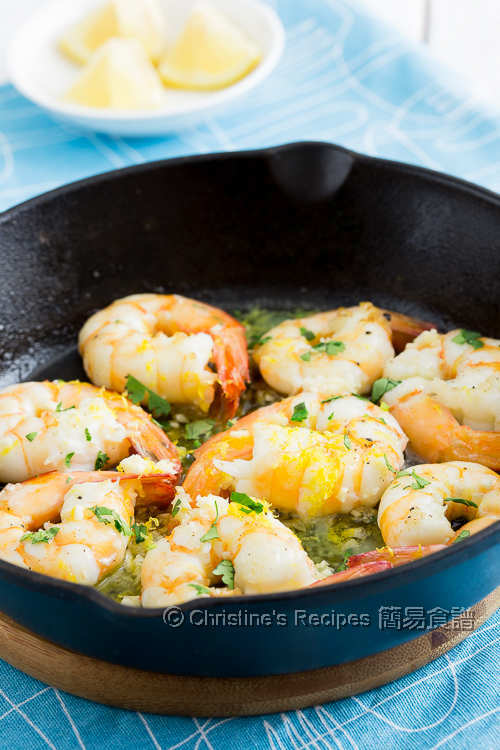 Even after we finished all the prawns, the skillet was still warm. 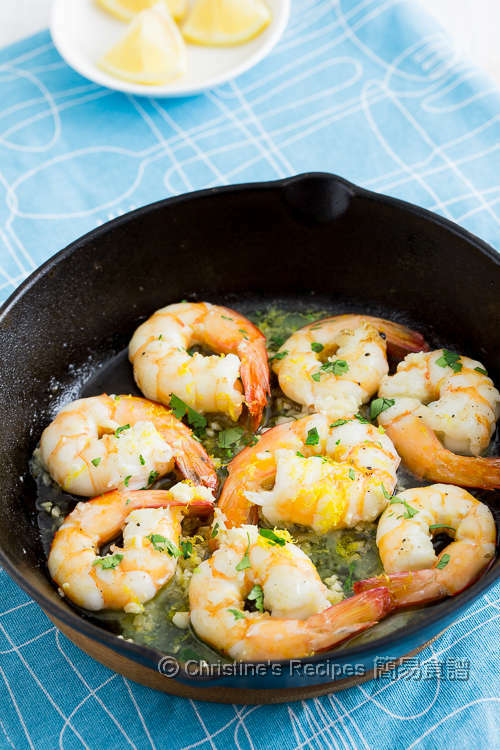 The ingredients used in this recipe were very simple, every kitchen pantry would have stock, garlic and lemon, taking the prawns up a notch with a fresh aroma. Shell and devein the prawns, retaining the tails. Rinse and wipe dry with kitchen towels. Season with salt and pepper. Heat a skillet or frying pan over medium high heat. Add oil and butter. 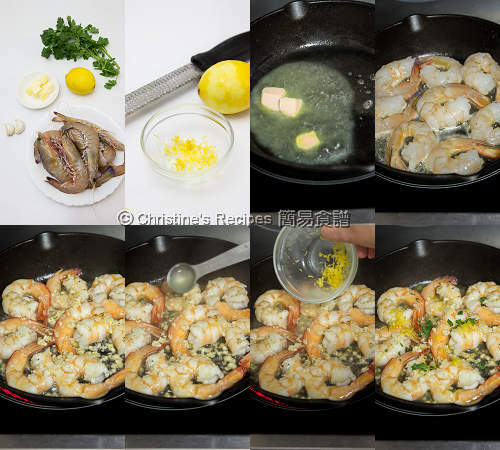 Place the prawns in one layer. Pan-fry for about 2 minutes. Flip over the other side. Add garlic, lemon zest, lemon juice. Cook for 1 to 2 minutes, until the prawns turn pink and opaque. Serve immediately. Make sure not to over cook the prawns. You don’t want them turn rubbery. If using a skillet, you can serve this dish with the skillet to keep warm longer. Garlic, lemon and butter...o man...I am very sure that I would lick the plate clean!